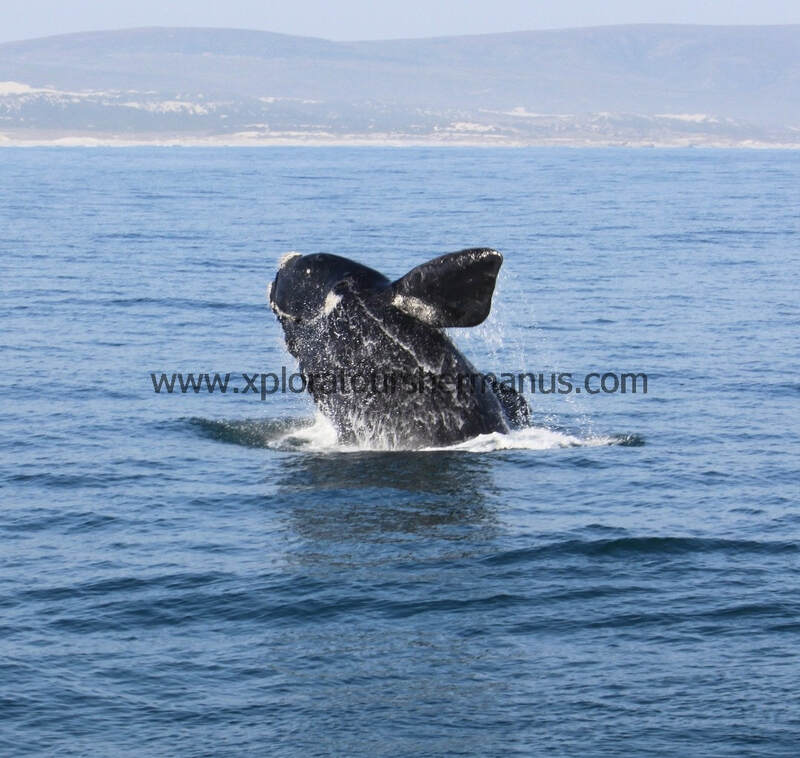 The migrating Southern Right Whales are the major attraction as they are here for 5 to 6 months to mate and give birth; while also being easy to spot, are very acrobatic and highly active. Humpbacks and Bryde's Whales are also spotted, plus African Penguins, Cape Fur Seals, Skuas and many sea birds are also viewed, with occasionally pods of 3 species of Dolphin - Common, Hump-Back and Bottle-nosed. 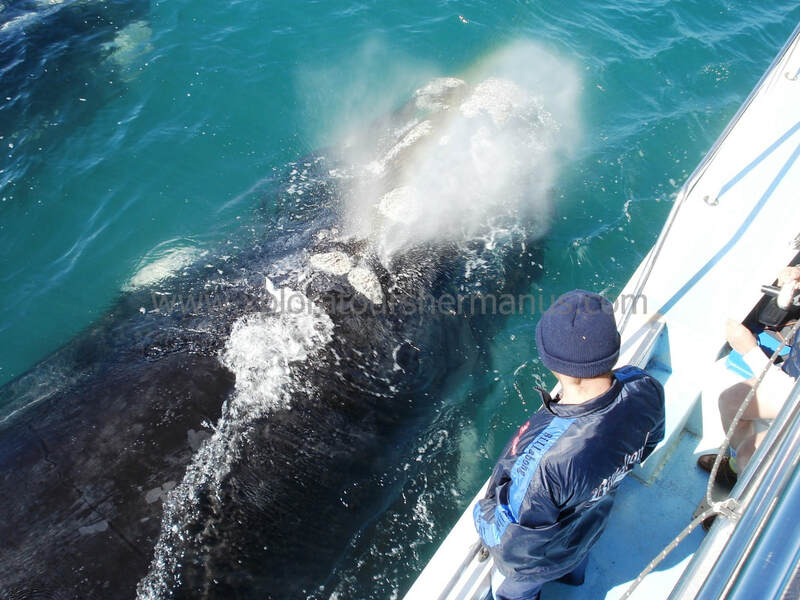 Only 5 boat licenses are issued so as to minimize disturbing the whales. 3 operate at Hermanus, 1 at Kleinbaai and 1 at Gansbaai, which are about 45 minutes drive around the bay from Hermanus - Boat trips are 2 to 3 hours long. 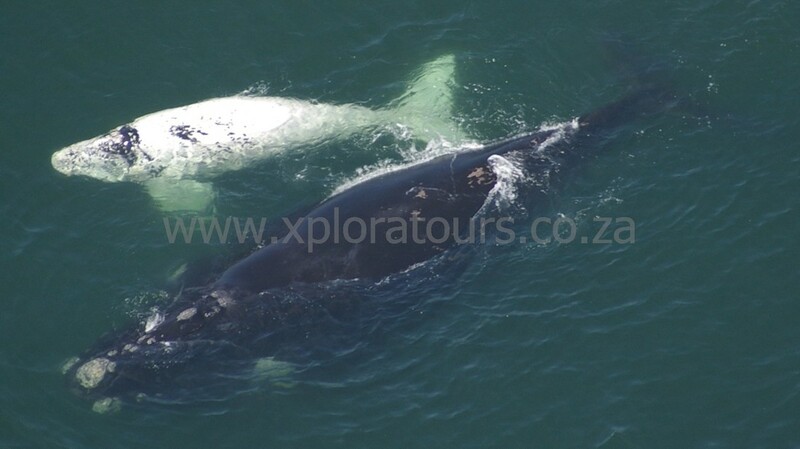 Whale Watching walking tours will take you on a gentle walk along our scenic cliff tops for 2 to 3 hours, with our experienced Whale Watching Tour Guide who will take you to all the hidden coves. Visiting the Whale Museum for 20mins to discuss many whale related topics will start this tour. You might also wish to consider Kayaking in the bay, which is a gentle paddle for 2 hours to explore our coastline from the sea in our stable Kayaks. Each Kayak can take 2 persons and is a lovely way to encounter Seals, Penguins, birdlife and hopefully pods of Whales (June to late Nov) and Dolphin, with the incredibly pretty back-drop of our mountains surrounding you. For an incredible birds-eye view of the Whales and the pretty scenery, then how about a flight over all of this fabulous natural splendour? Cessna plane flights allow 3 persons to fly at once and offer you – 30mins / 45mins / 60mins flights. Maximum combined weight of 3 passengers and camera gear must be less than 250kgs per flight. We can also arrange return transfers to/from any destination (for example Cape Town) to/from the Whales at Hermanus – please inform us if we can assist you with transport.